As France scales back its military operation in Mali, the European Union is trying to turn Mali's army into a professional fighting force to take on Islamist militants and other rebel fighters. Irish and British troops have joined an EU mission: 31 soldiers from the Royal Marines, 1st Battalion The Royal Irish Regiment and the Irish Defence Forces are training an initial group of some 800 Malian troops. The project aims to create four new battalions capable of defending the West African country. In January, France sent 4,000 troops to Mali after the Islamist fighters, who nine months before had taken over the vast northern desert region, began to take over central towns - threatening the capital, Bamako, in the south. Their advance was helped by the fact that members of the divided and demoralised Malian army took off their uniforms and fled their positions. Major Simon Holden, from the Royal Irish, who is commanding British and Irish trainers in Mali, said the standard of the first Malians going through the 10-week course was higher than he had expected. ''What we are here to do is form a battalion into a cohesive unit so that it's ready to go on operations at the end the 10-week package. The British and Irish trainers are part of the European Union Training Mission to Mali (EUTM). It is made up of some 200 trainers from France, the UK, Ireland and 19 other countries and has an initial brief to train 2,000 Malians. The British and Irish troops are largely carrying out infantry training; the Greeks handle intelligence classes; and Germany has built a field hospital at the training camp at Koulikoro, about 60km (37 miles) north of Bamako. Brussels is spending 12.3m euros (£10.3m, $16m) on the facilities and administration of EUTM. Contributing countries pay the salaries and living expenses of their own soldiers. Most of the practical training takes place in scrubland on a hill above Koulikoro. Groups of two dozen Malian soldiers, in uniforms provided by France and carrying brand new, unloaded Kalashnikovs, are led by their trainers through mock assaults. When directed, they hunker down or lie flat and say ''pow-pow-pow'' to imitate the sound of firing. The training mission aims to build cohesion among the soldiers who are of different ages and ranks and do not know each other as they have been hand-picked for the course from across the country by the Malian armed forces. The soldiers appear ethnically mixed - both pale and dark-skinned - but the Malian authorities have not given details of how they were selected. Amnesty International and Human Rights Watch say that Malian soldiers have been guilty of human rights crimes against civilians they suspect of having hidden rebels. The EUTM says it has asked civil society groups to come forward with names of any soldiers suspected of abuses. But it adds that it considers the issue of the trainees' past records to be a political matter, irrelevant to their military training. Irish Defence Forces trainer, Sgt Gerry Setright, said outside agencies would carry out human rights training at Koulikoro. ''The UN and other civilian organisations give all the Malian soldiers human rights training - how to handle prisoners of war and how to handle non-combatants. "We emphasise that training in our field exercises by building scenarios where they have to take prisoners and treat them correctly, just as we would in Ireland and the UK." Sgt Setright says they are taught "respect for sensitive locations such as libraries and mosques and historical monuments and so on". There is an urgent need for Mali to be able to deploy an army worthy of the name. France wants to withdraw most of its troops by the end of the year and hand over patrolling duties to an international force which was approved by the UN Security Council on 25 April - Minusma (the United Nations Multidimensional Integrated Stabilisation Mission in Mali). But the former colonial power's decision to keep 1,000 crack troops in the country to work alongside Minusma suggests France realises that EUTM graduates will be unable to shoulder anti-terror responsibilities. 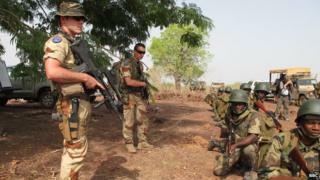 However well trained, Mali's army remains overstaffed, though no-one knows by how much due to years of phantom payrolls. A less visible element of EUTM will be a large-scale shake-up in personnel. Previous governments, fearing coups, have promoted legions of officers to high grades. Long-serving, low-ranking soldiers have remained in the force well past the age at which troops in other countries retire. The army is ill-equipped. Over the years, Mali has been given or sold cut-price or obsolete military equipment from different countries. One example is communications equipment from France, Russia and China, all of it set to different frequencies. Currently, in Mopti, in the north-east, soldiers are confined to base and only carry out patrols on days where the French Operation Serval gives them fuel for their patrol vehicles.